Cargo Area: 27,000 square meters with a terminal handling capacity of up to 350,000 tons of cargo per year. Planning for the project began in may 2008, with construction being commenced the following March 2009. Finally the terminal came into service in early October 2010. 4103009937 dated 08 April 2008 and issued by the Department of Planning and Investment in Ho Chi Minh City. 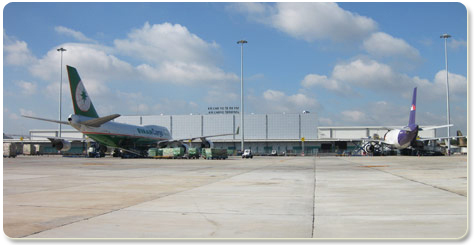 41121000112 dated 20 April 2009 for project of establishing an Air Cargo Terminal at Tan Son Nhat Airport and issued by the People Committee of Ho Chi Minh City. 1696/GPCCDV-CHK dated 28/05/2010 and granting SCSC the right to provide International Air Cargo Terminal services.